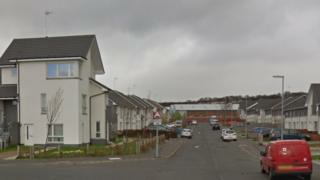 A taxi driver had his car stolen by a man wielding a knife after being called to a house in the north of Glasgow. The robbery happened in Tambowie Street, in the Temple area of the city, at about 21:00 on Friday 31 August. Police Scotland said an armed man got out of a Vauxhall car when the Hyundai i30 taxi parked in the street, and forced the driver out. The robber then drove off in the stolen car while a woman accomplice sped off in the Vauxhall. The taxi driver did not sustain any injuries but has been left badly shaken by the incident. His car was later found burned-out on the canal path behind Rotherwood Avenue. The suspect is white, aged between 30 and 35, about 6ft tall, with short, shaved hair. He was wearing a grey tracksuit at the time of the incident. A Police Scotland spokesman said there was limited information on the woman in the Vauxhall car, other than she was wearing a pink long-sleeved top. CCTV footage has shown the Hyundai i30 being driven at excessive speed along Baldwin Avenue, Knighstwood, before eventually being abandoned and set on fire. Det Con Chris Sneddon said: "We do not know why this taxi driver has been attacked and had his cab stolen from him, the attack was completely random. "We're aware there were several people in the area around the time this incident occurred and I am appealing to them to contact us. "At this stage, we don't know how long the Vauxhall car with the male suspect and the woman was parked in the street. "The stolen vehicle was speeding as it made off and people in the surrounding areas may have noticed the car given its excessive speed. If anyone has any information or knowledge regarding this incident or the suspects, then please get in touch with us."